Born in Pittsburgh, Awadagin Pratt began studying piano at the age of six. Three years later, having moved to Normal, Illinois with his family, he also began studying violin. At the age of 16 he entered the University of Illinois where he studied piano, violin and conducting. He subsequently enrolled at the Peabody Conservatory of Music where he became the first student in the school's history to receive diplomas in three performance areas – piano, violin and conducting. In recognition of this achievement and for his work in the field of classical music, Pratt recently received the Distinguished Alumni Award from Johns Hopkins. In 1992 Pratt won the Naumburg International Piano Competition and two years later was awarded an Avery Fisher Career Grant. Since then, he has played numerous recitals throughout the US including performances at Lincoln Center, Kennedy Center, Dorothy Chandler Pavilion in Los Angeles and Chicago’s Orchestra Hall. His many orchestral performances include appearances with the New York Philharmonic, Minnesota Orchestra and the Pittsburgh, Atlanta, Baltimore, St. Louis, National, Detroit and New Jersey symphonies among many others. Summer festival engagements include Ravinia, Blossom, Wolftrap, Caramoor and Aspen, the Hollywood Bowl and the Mostly Mozart Festival in Tokyo. As a conductor, Pratt participated in the American Symphony Orchestra League and Conductor's Guild workshops and the National Conducting Institute, where he worked closely with Leonard Slatkin and conducted the National Symphony at the Kennedy Center. He has also conducted the Toledo, New Mexico, Vancouver WA, Winston-Salem, Santa Fe and Prince George County symphonies, the Northwest Sinfonietta, the Concertante di Chicago and several orchestras in Japan. A great favorite on college and university performing arts series and a strong advocate of music education, Pratt participates in numerous residency and outreach activities wherever he appears; these activities may include master classes, children's recitals, play/talk demonstrations and question/answer sessions for students of all ages. Pratt has been the subject of numerous articles in the national press, including Newsweek, People Magazine and New York Newsday. He was named one of the 50 Leaders of Tomorrow in Ebony Magazine's special 50th anniversary issue and has been featured on National Public Radio's Performance Today, St. Paul Sunday Morning and Weekend Edition. On television, Pratt has performed on the Today Show, Good Morning America and Sesame Street, been profiled on CBS Sunday Morning and was one of the featured soloists on PBS's Live from the Kennedy Center - A Salute to Slava. In November 2009, Pratt was one of four artists selected to perform at a White House classical music event that included student workshops hosted by First Lady Michelle Obama and performed in concert for guests including President Obama. He has performed two other times at the White House, both at the invitation of President and Mrs. Clinton. Pratt’s recordings for Angel/EMI include A Long Way From Normal, an all Beethoven Sonata CD, Live From South Africa, Transformations and an all Bach disc with the St. Lawrence String Quartet. His most recent recordings are the Brahms Sonatas for Cello and Piano with Zuill Bailey for Telarc and a recording of the music of Judith Lang Zaimont with the Harlem Quartet for Navona Records. 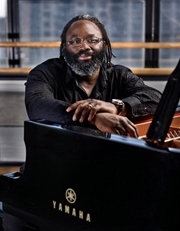 Pratt is currently Professor of Piano and Artist in Residence at CCM. He was recently named the Artistic Director of the Cincinnati World Piano Competition and is also the Artistic Director of the Art of the Piano Festival at CCM. Performance Certificate and Graduate Performance Diploma, The Peabody Institute.